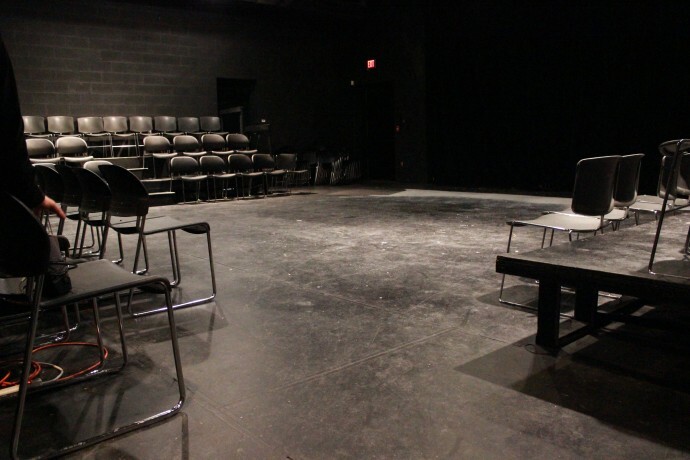 The School of the Arts Black Box Theatre is the perfect venue for experimental theatre, one-act shows, dramatic pieces, small musical presentations and pieces where audience involvement is key to the success of the production. It is also ideal for small casts, improv and comedy troupes, and spoken word. It is an extremely intimate space where performers can establish rapport with the audience. The SOTA Black Box is perfect for those artists who wish to create an instant “atmosphere” for the audience. There is a back-stage crossover. The theatre has very limited wing space to accommodate temporary set storage and quick costume changes. However, there is a room located adjacent to the space which may be used as a backstage wing. The theatre has sound and lighting systems and keyboard which may be accessed upon request. Dressing rooms and restrooms are located within close proximity to the space. Seating is positioned on three sides; the maximum capacity is 80. The Black Box Theatre is handicapped accessible. Please Note: SOTA does charge a nominal technical fee for the Fringe performances we host. 80 seats arranged as Three quarters - audience on three sides with one back wall. 50 circuits, 30 instruments available. Isolation is available and two different washes (3 back and 3 front - warm and cool). Two speakers hanging on grid with CD player in booth. No mics available in this space (contact us for info if interested in mics). There is a small lounge area stage-right that can be used as a dressing room.